With suspected fraud you need to act fast, especially with employee or business fraud. 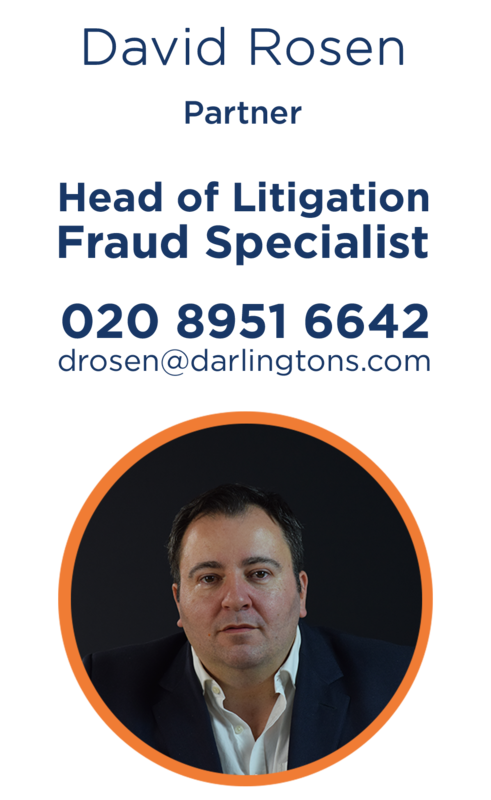 David Rosen, our head of litigation, supported by the litigation team, is an accredited and experienced fraud solicitor and has acted for both claimants and defendants in civil fraud trials and for defendants in criminal fraud trials. asset tracing and recovery strategies. the prevention and detection of fraud. internal company investigations for businesses involving fraud, corruption, regulatory and disciplinary breaches, serious wrongdoing or misconduct. civil injunctions, including freezing orders and search orders, and orders for disclosure of information and documents. restraint and confiscation proceedings under the civil fraud provisions of the Proceeds of Crime Act 2002. Contact us if you need expert advice and assistance on any fraud related issue or legal concern. What is false accounting fraud? False accounting is a business crime – it’s dishonest altering, destroying, hiding, or fabricating of accounts records with a view to gain for oneself, or cause loss to another. It also includes providing misleading or deceptive documents, or omitting relevant documents when accounts information is requested. Someone involved in making an entry in an account which could be misleading, false or deceptive in a a significant way, or who leaves out something relevant from an account or other document, is treated as having falsified the document (or account). Falsification can include the preparation of false accounts as well as the alteration of existing ones, and this is often a feature of false accounting cases. The omission of material information from an account or equivalent can amount to falsification. So an employee whose task it is to record transactions, such as a till operator, may commit the offence. It is always necessary that the records were omitted dishonestly. Get in touch with David Rosen if you need a lawyer for a fraud or suspected business crime issue or are facing allegations of fraud against you. We are experienced in offering cost effective, experienced advice and services to prevent or deter fraud. Given the damage business crime causes it makes good business sense to invest in prevention. Employees contemplating committing fraud are likely to think twice if they see that lawyers are already retained to train staff to spot fraud, the warning signs and that the business is above to the dangers . Regular internal audits – management reviews, and internal audits, to discover fraud in an organisation. Confidential whistleblowing advice – in organisations that had ‘hotlines’, there was an increase in fraud reporting by both employees and customers. Establish and review controls and warnings – not just ‘box-ticking’ checks and controls in place assisted by our specialist fraud lawyers. These controls of anti-fraud must be taken and imposed seriously upon employees, and to that end, there should be Fraud Training for senior management. Training and policies against fraud – we regularly assist with training and compliance. Consultation is recommended across the organisation. It should then be put in place and imposed, rather than shelved because it was a job half-done (a common issue with small businesses is failing to complete and implement). External audit and surprise audits. We are regularly instructed by clients for advice on fraud prevention – our lawyers deal with cases where fraud has occurred we are well placed to advise clients how to stop it, minimise the risk, spot the potential warning signs of fraud and make a potential fraudster think twice. Get in touch to discuss how we can assist you. if a significant amount of money is missing, you may need to consider applying for an injunction urgently. whilst you may strongly suspect fraud and may have evidence pointing to certain employees, you still need to carefully follow due process including employment law process. Acting precipitously creates employment law risks. the way an investigation is carried out is crucial – any evidence must be obtained in the right way, balancing the legitimate right to protect your business interests with privacy law issues and getting and retaining evidence in away that may be admissable in court. If evidence is not obtained with a suspected business crime in the right way, it may not be usable. Evidence relating to business crime is now often found on computers or other digital data and court rules make clear that such evidence must be obtained and preserved in the correct way. An even bigger risk is potentially instructing Private Investigators who may not represent your interests the right way, or at worse, could expose you or your business to legal risks. Fraud at work is a serious problem and as employer, you want to minimise the risks of course, but you must also keep in mind employment law. You may be good at spotting possible changes of behaviour by your staff and suspect a member of staff of fraud, but you must be careful. Employees have rights to privacy and it’s unlawful and possibly illegal to monitor staff without their knowledge. If you catch an employee “red handed” with a business crime impacting your business, it is extremely tempting and understandable to feel so angry that you want to dismiss them on the spot. However, you must be mindful of the employee’s rights to fair process otherwise you may find yourself with an unfair dismissal or discrimination claim, as obscene as that may seem. Our fraud solicitors can advise and assist on how to deal with lawful monitoring or surveillance of employees, vetting staff before you employ them. with employment investigations where fraud is suspected and ensuring that you deal with fraud at work in the right way as employer.